Dubai; one of the seven emirates of UAE, Dubai is the main highlight for business activities and what not! One will find oneself surrounded with malls, structurally amazing buildings and beauty over here. Tourists are drawn to Dubai and it was nominated number eight in 2007 on the list of most popular and visited places on earth. Because of all the recent development in Dubai, economical growth has occurred at quite a fast pace. You will find luxuries, expensive one, and people who are rich enough to afford them. However, this means that even the most expensive of stuff is quite normal at Dubai. You won’t stand out in the crowd if you’re carrying an expensive mobile phone or a sports car. Since that is what people want; to stand out in the crowd, it provides with business owners to explore their creativity. Such endeavors result in ideas such as that which has been introduced by Cars Coin. Cars Coin is a Dubai based car tuning company and it came up with the original idea of providing luxury vehicles with a new, unique and shiny look. What they do is simple; they cover rides with coins, tens of thousands of coins, resulting in cars that ‘shine as if they were made of diamonds’. Like we mentioned earlier, it is next to impossible to make your expensive car stand out in the UAE. Whatever model you are driving, chances are that there are hundreds of such cars moving around Dubai and Abu Dhabi. Covering the car in gold foil has become too ‘normal’ as well. At such times, Car Coins’ idea is very appealing. The group of tuning enthusiasts, working in an independent car workshop in Dubai, has specialized in covering luxury cars in coins. 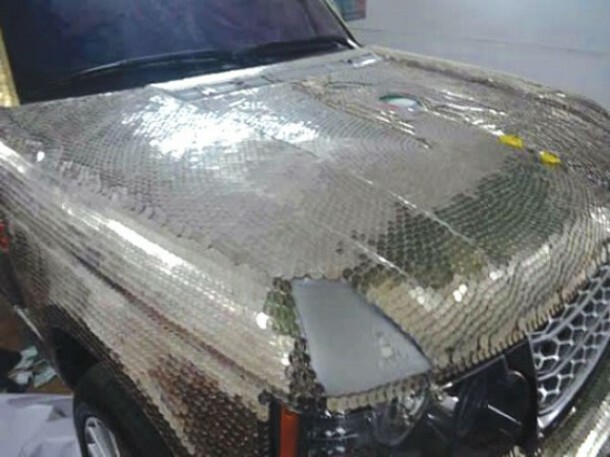 The latest addition to their creations is a 2013 Range Rover which has been covered with an astonishing number of 57, 412 old Dirham coins. Weeks were dedicated into making this car look unique. Each coin was shined and glued to the body of car by hand. There’s news that the addition of these coins has resulted in an increase of the weight of the SUV and Range Rover now weighs an extra 170 kilos thanks to the modification done to it. To make sure that the owner of car doesn’t have to worry about people stealing the coins off the body of car, the team has used coins that are no longer in circulation. Although it is unlikely that anybody in UAE would need that extra change. Just so that you know, these guys aren’t amateurs and this Range Rover isn’t their first creation. 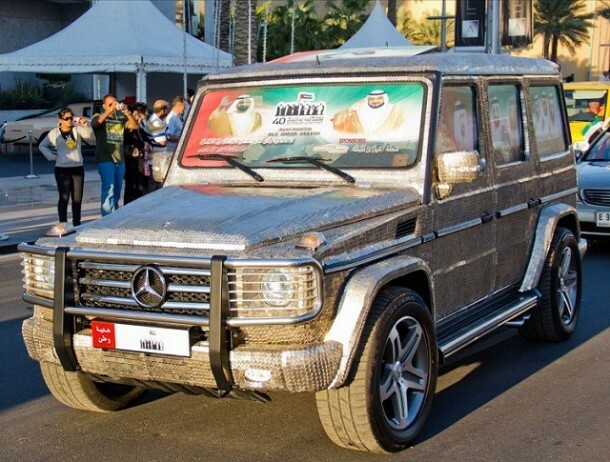 Their first shiny and amazing art work was displayed in 2011 when they unveiled the Mercedes Benz G55 AMG draped in shiny 1 Dirham coins. Total number of coins used amounted up to 47,000. The team always makes sure to include flags of Arab countries in their artwork and also Arab leaders. This shiny service and idea might perhaps be only successful in UAE, for we fear not many other folks in other countries would have enough cash to spend on such extravagant modification. Still, hats-off to the brilliant idea of Cars Coin.